The Underground is a bold reimagining of retail in New York City—starting 30 feet below street-level. By activating the senses and embracing its unique perspective, Neoscape transformed The Underground into a must-see experience. Neoscape worked closely with the Rockefeller Group to produce a series of assets for 1221 Avenue of the Americas. Legendary architecture firm Harrison & Abramovitz & Harris designed the tower and Antonio Citterio Patricia Viel (ACPV) designed the retail portion renamed “The Underground.” The award-winning modernization of the building is punctuated with groundbreaking retail and captures the energy and limitless possibilities of New York. Neoscape’s marketing assets depicted the unique otherworldly retail escape hidden beneath the office portion of the tower and illuminated by the sky above. Our objective was to create visibility and awareness to attract retailers and tenants into the below-grade concept. The team led a strategic visioning session with the client to articulate the authentic distinctives that would elevate the brand above the typical retail landscape. The project’s defining visual solution was sparked by the architect’s vision of “a puncture in the ground’s skin, opening up to an otherworldly experience below.” The resulting sketch evoked Alice in Wonderland’s “Down the Rabbit Hole” and captured a feeling of being 30 feet below the roadway, staring up through nature with the city beyond. Above, the senses are assailed by the clamoring noise, slabs of concrete, and frenetic motion of people and machines all around. Below, we find a bright, calming oasis—a sanctuary that refreshes all five of the senses. This unexpected world emerges by embracing delightful retail experiences set in the midst of an altered perspective. We began with a multi-layered visual identity. 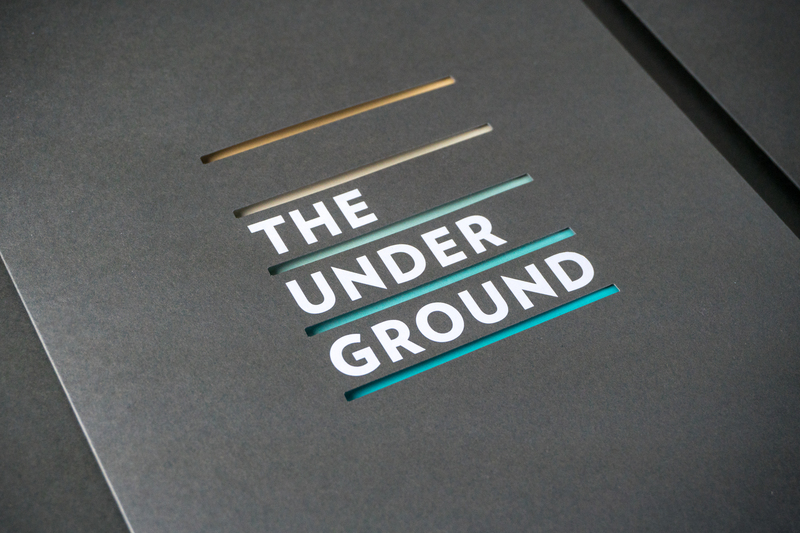 The five lines in the logo represent the five below-ground stories of retail, truly embracing The Underground’s tiered, multi-level experience. This concept is carried through the brochure with different page sizes to represent the multiple categories of space—a choose-your-own adventure that allows the reader to easily jump to the relevant section. The artwork selected for the brochure does not reflect what is typically seen in a real estate fodder. This piece is far more sensory. It favors light and activity, portraying a more abstract movement of people to suggest foot traffic without saying it. 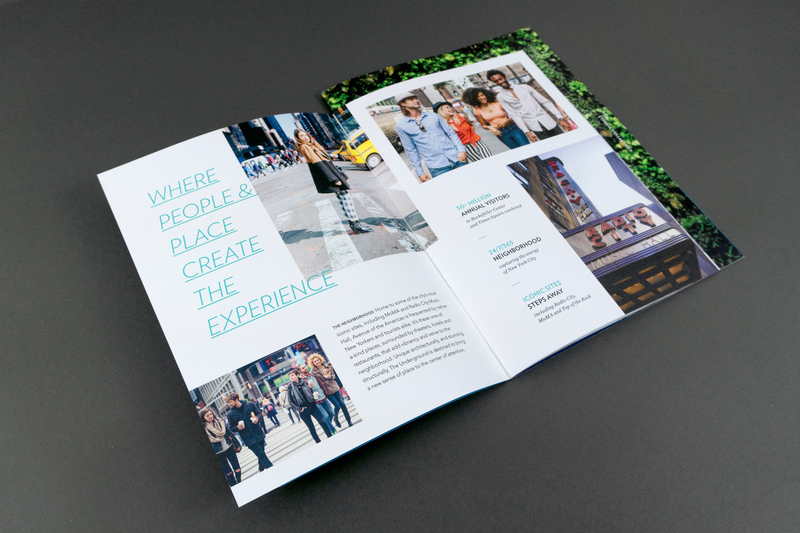 The brochure’s folder represents the outside--the grey concrete jungle--with small slit-like openings that allow glimpses inside the oasis, and that ultimately open into the unexpected experience. The gradient of colors, first seen through the folder’s slits, conceptualizes sunlight pouring in from above, leading you down into a lush, green oasis. We also created a short marketing film for the project. Again, this is not your typical real estate fly-through of a building. It is more abstract and, because of this, we can harness sensorial elements more explicitly, inserting shots that reference the senses or physical reactions to stimuli. Additionally, our team created the visuals to support this concept of an underground sanctuary, packaging them neatly into a robust ipad application. Renderings showcased a beautiful retail space with clear connections to the natural world, and a series of virtual reality nodes fully immerse the viewer into this otherworldly experience. 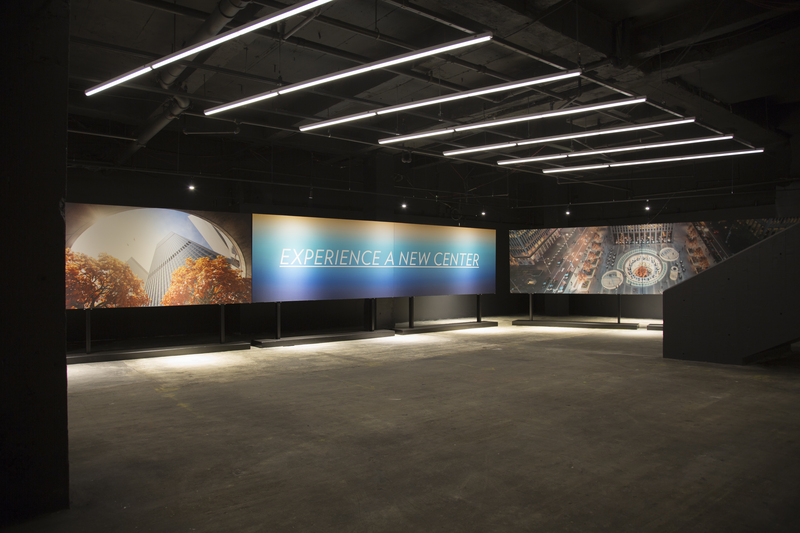 Lastly, we created a marketing center that combined the new brand and messaging with stunning large-format visuals to help attract potential tenants.